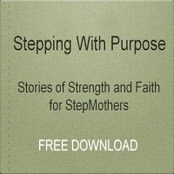 When you become a stepmom there are many times you ask the question-WHY? Why is being a stepmom so hard at times? Why can't a spouse and their ex get along for the childs sake? Why do people harbor so much resentment that it affects their health after a divorce? Why did my child not want to come to visit me on my weekend to have them? Why so many lies? Why do some people think stepmoms are wicked? Why did my stepdaughters biological mom die at this time of her life? As I was walking recently,I was asking God some WHY's and this is what I am learning. God allows all of us to be tested and when you are a step parent you are definitely tested and ask WHY many times. God knows about all of our "stuff" we have in our lives.He knows what is going to happen in our lives and what we are going through and will go through. .I am learning to try not to fix and solve everything in life.I am learning to quit asking God so many WHY questions and to let him be the ruler of my life in all my problems.God can handle all of our"stuff" if we just let go of our worries and WHY's and give them to him.Are you surrendered to give him all your stuff? Continuing the Journey!